I was sitting in a medical practice the other day and had a real eye opener to what could be happening in many practices. I heard things said that I wish I had not. The first thing I heard was how patients were greeted when they arrived for their appointment? Asking a patient when they arrive at the practice, if they have been there before, is not a great start especially if the patient is a long term patient. Oops now it is a little awkward! The patient was embarrassed and the front office was embarrassed. I could see the patient was confused and felt unimportant. I felt awkward just listening to this conversation. The front office did not apologise for the oversight and this made the patient feel even more unimportant. If the front office did not know the patient why not ask for the appointment time. You can then work out who the patient is without all the embarrassment. The next thing I noticed was the inability to answer a call by 3 rings. A ringing phone does not just leave a person hanging on the phone waiting but the patients in the patient lounge are listening to a phone ring, ring and ring! This is never good. Make sure you have a well thought out phone greeting. Thank the caller for calling/choosing your practice, introduce your practice and your name then offer to help them. I also saw people on the team chatting between themselves about non dental while the phone was ringing. Now is not the time to chat about the type of coffee you had that morning. A ringing phone must be answered as soon as possible. The phone is the lifeline to your business and patients are waiting anxiously most of the time. Never ask a caller if they would like to make an appointment. Presume they do want to make an appointment, after all, they have called you with a dental need and so an appointment is what they need. Squeezing a patient in seems like their appointment is not important and of value. Avoid saying this at all times. Why do some offices ask this first. Ask for the patient’s first name. Say it back in the conversation then ask for their surname. This sends the message to your patients that we get lots of cancellations and this is normal. This just adds to the cancellation mindset that we are trying to prevent. You can see there are so many things being said to a patient when they arrive for their appointment or on the phone call, that could be said so much better. Check this is not what your team is saying to patients. My next public speaking event is my live full day Master Class “How to Turn Every Dental Phone Call Into A Valued and Kept Appointment” and is being held in Perth on Friday 1st June 2018. Click here for information on Perth. 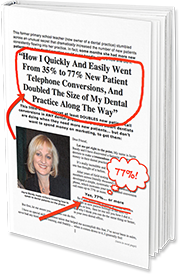 After Perth I will be presenting my Master Class “How to Turn Every Dental Phone Call Into A Valued and Kept Appointment” on the Gold Coast on Thursday 7th June 2018. Click here for information on the Gold Coast.